I’m affraid, Skaven Slaves are essential. Skaven Slaves are weak, almost no fighting power on the battlefield. Cannon Fodder. Their stats are so damn poor, that every Skaven general is whining: “Why I even must deal with them? Why they are not Stormvermin? !” But for some reason Slaves are part of almost every Skaven army list. They will lose every combat, they will perish quicker before you can say: Bring me victory, my precious Rats! But they are there – army lists are full of them. I mean, just use Google and type: “xxxx point Skaven army list” and I bet Slaves will be included in most of army lists appeared on your search results. Oh, yes they are popular! Why is that? The answer is: 2 freaking points per model. Simply as that. I think, there is no cheaper model in whole Warhammer Fantasy game. You can deploy hundreds of Skaven Slaves, swarming an opponent with vermin infestation, and you can barely feel cost of it. I know, there are players who use ONLY Slaves for their army (at least Core choice:). It’s not a big surprise, it is tempting tactics. 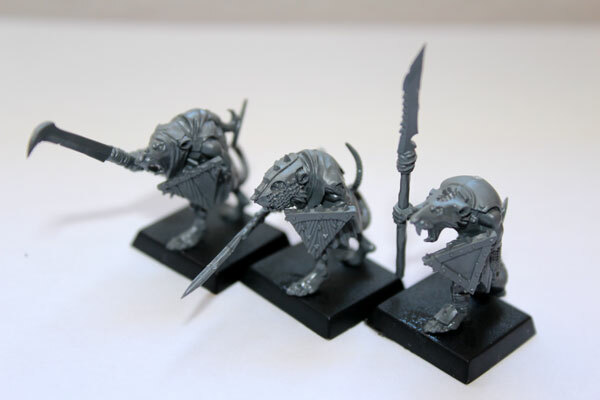 After all, 2 Skaven Slaves = 1 Clanrat, 3 Slaves = 1 Stormvermin (3 and 1/3 to be exact:). Oh, sweet Vermin Lord, you can’t beat those numbers! They are weak and chicken-hearted (what I mean: they are MORE chicken-hearted then rest of Skavens:), but their life is cheap and can be easily replaced by even more Slaves. The opponent will be overrun by swarms of rats. Of course, that is the theory. Usually, in real life, it’s not that simple. Imagine Slaves against Chaos or even not such tough guys – Dwarfs or Orks. They will bounce back, no matter how many of them will be on the battlefield. Not a chance in combat. Even if, for some miraculous reason, they will be able to wound, for example, Chaos Warrior, still there is Armour Save, which is ridiculously high. It will be against any odds to kill even one Chaos Warrior. Even the largest regiment of Slaves will be wiped out in few rounds of combat (unless you have 100 Slaves regiment, or more:) So better not to rely only on them. After all they are slaves. The lowest for of life in Skaven society. What the good Skaven general should do then? Use mass of Slaves – sure. But only for distracting and blocking the most annoying, strongest, toughest regiments of the enemy. Hold his elite. At least for a turn. This tactic is especially worthwhile against regiments with frenzy. Just expose your Slaves to frenzied regiments, and they will not have any choice and attack.And while his top troops are engaged in pointless combat with Skaven weaklings, you can hunt down enemy’s weaker regiments. You will need for this better units than Slaves. 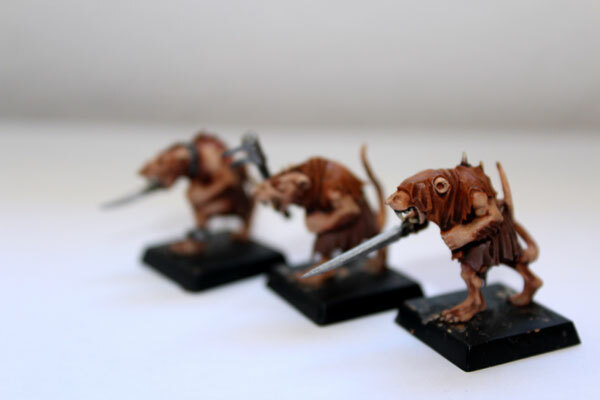 My favourite unit is Stormvermin, but Plague Monks or Rat Ogres can also do good. I know it’s very popular and possibly effective tactics in competitive games. I’m afraid not for me. I just don’t like huge regiments. My maximum is 30 men in the regiment. I know it’s not a such a high number when it comes to Skaven units for competitive battles. This is not the big problem for me – I simply play casual battles. I include what I like in my army list. I include average sized regiments of any kind. 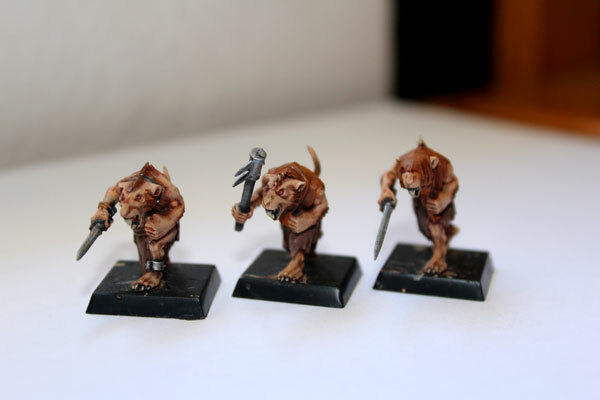 Stormvermin, Clanrats, Slaves, Rat Ogres, whatever it looks nice on tabletop, and whatever bring me fun. And fun is most important part of gaming right now. I had this ‘competitiveness period’ but I’m leaving it behind and I try to concentrate on maximum enjoyment. So, in just few words, swarming the enemy with Slaves, is not for my. And it’s actually good for me! I will not have to paint so many Slaves – I just need one 30 of men unit strong (just one month of painting:). At least for start. It is always like that. When I paint, I think about the minis I paint and plan strategies that involve them. I spend a little bit more time over plastic Slaves, than I planned originally. There was some obstacles though. I started them last week. I think it was Tuesday or Monday. And during past 6 days I changed the place twice. First I moved from California Baja to Mexico City in Thursday, and in Saturday to Oaxaca. Tomorrow I’ll go to Huatulco (and there I finally will have more time:). So in one week, three days of almost all day trips. Not too much time left for painting. Even though, my first three Slaves are ready! 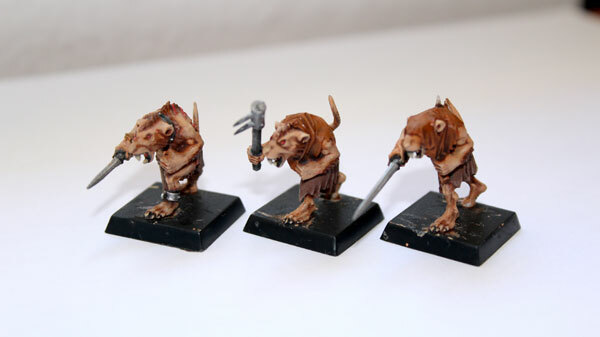 As you can see, these Slaves are actually part of Clanrats plastic box. 10 of them don’t have any armour, wear rugs and are looking poor and miserable. Perfect Slaves, I would say… Some of them even have chains and shackles. They are not Clanrats! They are Slaves! By the power given to me by Council of Thirteen – I name you my Slaves! Cannon Fodder – that’s what they are. Ps. I know I sound like Captain Obvious here, giving the strategy for Slaves that probably every Skaven General knows (or should know), but when I start writing here about my newly painted minis, I got this thinking, I should start with the beginning. And all of the sudden this beginning become wider then the middle of the post itself. So it is,like it is:) I hope you like photos of my minis though. Until next time! I think Skaven would be my second interest next to Chaos if I ever gamed in FB. These rats look pretty sweet already. Base them and you’re done! Am I a fool that my Skaven army does not have any slaves? 😉 In my clan Mors army I have quite a lot of Stormvermin though. 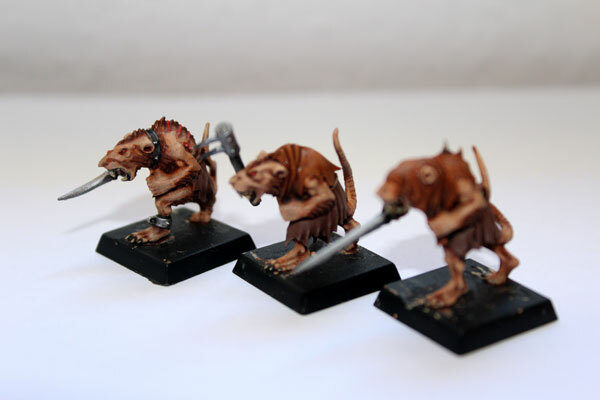 As I like to build ‘fluffy’ armies, I thought that the most wealthy Warlord Clan would have lots of well equiped rats. I also thought that Clan Mors would even supply their slaves with some decent weapons. So instead of adding slaves in my army, opted for a number of huge Clanrat regiments. …but I like the idea – army with no slaves. Lots of Skaven players use too many slaves these days – instead of Clanrats or my beloved Stormvermin – just to be more competitive. Previous PostAre Stormvermin any good ? Next PostDiscworld will go on.